"Our problems are our rewards. It's part of our heritage -- to compete, to be challenged." its sole purpose is to make strangers smile,"
HUMBOLDT COUNTY -- Celebrations continue on Cobb Mountain where Tappy and Keith Nelson live with their mechanical pet "Melvin." During the Memorial Day weekend, Melvin and the Nelsons, and third pilot Dave Rempe of Novato, were crowned grand champion at the 37th Annual Arcata-To-Ferndale Cross Country Kinetic Sculpture Race. Melvin consists mostly of seven wheels and three sets of bicycle pedals and the art work, which is a vital element for this racing machine. Kinetic Sculpture Racing has been called a sport, a hobby, an engineering contest and an art-form. It is all of that, and to many participants it is almost a second family. Says Tappy Nelson: "It is creative, humorous, fun, crazy and healthy and we get to hang out with other creative, humorous, fun, crazy and healthy people. We love our kinetic family." Longtime residents of Cobb, the Nelsons also have normal lives, of course. Tappy is a fourth-grade teacher at Cobb Mountain Elementary and Keith is a control technician at Calpine in the Geysers. Their son Kristopher is also active in the sport, having raced successfully on his own and now serving as "pit crew" for his parents. Ron Haworth and Alex Richardson round out the team. Kinetic Sculpture Racing was founded in the Humboldt County town of Ferndale in 1969 when metal sculptor Hobart Brown built a five-wheeled tricycle for his son. A fellow artist one-upped him and a block-long race ensued. Today the annual race starts in Arcata and ends 40 miles and three days later at the original finish line on Ferndale's Main Street. Racers travel over back roads, sand dunes, water, mud and anything else that nature might throw at them, and camping outdoors is required to qualify for trophies. The only rule, other than basic safety precautions, is that the vehicles must be human-powered. Most teams, like the Nelsons, rely heavily on bicycle parts, but any mechanism is allowed so long as the energy comes only from the riders themselves. Art and pageantry is just as important as speed, and outright whimsy is encouraged. A key element of the sport is the difficult transition from water to land, where many teams find themselves unable to get traction when their front wheels are already butting against the shore. The Nelsons solve the problem by letting the air out of Melvin's inflatable pontoons just as they reach shore, thus deliberately sinking the vehicle until the drive wheels gain purchase on the bottom. So what if they all get a bit wet in the process. Having perfected the mechanical function of their three-piece train of bicycle parts years ago, the Nelsons now concentrate on their artwork. Over its 24-year life, Melvin has been made up as a wide variety of critters all built from cardboard, chicken wire, cloth, papier-mch and similarly simple materials. This year's version portrays two little pigs being chased by the big bad wolf. With Melvin's patented performance over every terrain and the pilots' considerable muscular efforts, this getup earned top honors among the 45 entries from several states. Two other Lake County teams participated, but neither was able to finish the entire course without breakdowns. There are many other Kinetic Sculpture Races around the country, but the Nelsons usually limit themselves to the grand championship. They will make an exception this year by participating in the Third Annual Clearlake Kinetic Sculpture Race in the City of Clearlake Saturday, July 2. That race is part of the Redbud Parade and Patriotic Festival, and additional entries of every skill level are welcome. There is even a $200 reward for first prize, which may or may not go to the fastest team. Contact me by email at elliotsnaess-@msn.com, or call parade chairman Ray Bridges at 994-3070 for more information. The North Coast Journal is our official local media outlet. They published a 2 page tab insert in the May 19, 2005 issue which was available in kiosks all over our race course next weekend. The Eureka Times-Standard has run some lovely things about the WEB fashion show and the Rutabaga Queen party. Unfortunately, their online subscription policy precludes us from giving the urls to their pages as they will within one week make you pay to read them! The Carnivale Fantaveicoli sixth of February - the eighth annual "competitive parade of fantastic vehicles... 35 participants." A full update will be posted as soon as the competition is over. The Ferndale Museum has historical displays and a dollhouse of the Glorious Founder Hobart Brown's gallery and home on Main Street. Online gallery from Cyclops, who piloted a unicycle kinetic sculpture, crossing Humboldt Bay and the Eel River in a tiny inflatable dingy he carried in his backpack. Not only did he have enough energy at the finish to do a wheelie, he and his friends took pictures of it all! 2004 photos taken on board the machine by a pilot who had just arrived here by air through San Francisco from a business trip to Beijing. Talk about culture shock! Corporate Raiders from Team Y Knot. Third time's the charm, they aced in 2004. The site has a great quicktime movie of Corporate Raiders going down Dead Man's Drop. Online galleries by Karen Wallace. Karen, Tom and mechanic-nut Dave arrived from Baltimore the evening before the start, visited the Lab, helped take trophies to Hobart's, grabbed a few hours sleep, volunteered at the start, and followed the race on borrowed mountain bikes over the next three days, leaving minutes after the awards. Exhausted, driving to Sacramento to catch their flight east, they resolved to return next year. For the Glory! Photos and online journal by "photog5." Photo of Surly Burly before the artwork was added. Unconventional Use of BMW Motorcycle Transmissions in Kinetic Sculpture Racers, the drive system of the 2004 entry Henry Ford goes Surfing. It's worth downloading the 12-page 3.8 MB *.pdf file just to look at the pictures and dream. May 27, May 30 and June 4 Articles in the Eureka Times-Standard are available from them. A links list with information on how to build exotic bicycles, gearing mechanisms and more. HumFire's Eggstravaganza 2004 Photo gallery of this pre-Kinetic event for the smallest kinetinauts. Duane Flatmo's innovative and beautiful sculptures have run and aced the World Championship over the years. Ten of 20 Flatmo Kinetic Sculptures are in this online gallery from North Coast Journal. June Moxon's "Wild Ride" website lets you follow the construction of "Sparkles" in this innovative website by a World Championship multi-Ace and the first woman to build Kinetic Sculpture singlehandedly. 2003 Spectator's Blog by Brian Tiemann. Videos of several years including 2001. Ten percent of proceeds goes to the HKA for the Race. See Loch Nut Monster's Randy Frost being assisted by the Coast Guard in Humboldt Bay in this picture of the month from Matt Knowles. Arcata Eye, March 7, 2000 Glory days at Arcata's fantasy foundry about Arcata's Kinetic Lab. Barrel of Monkeys, formerly Cowtrans describe their race. Drum Roll journal and photographs from 2000. Description of the Course and a few entrants. Perth, Australia - Kinetic Sculpture Race. Sponsored by Rotary since 1999, this year's race benefits the Princess Margaret Hospital and includes a juried art exhibition, a search for genius and another for goddess, as well as an interesting through town and across the Swan River course. This year's race is the sixth annual and was held March 6th, 2004. Poland - Kinetic Sculpture Race ran in 1996 outside of Warsaw. Arcata to Ferndale Grand Championship Kinetic Sculpture Race Official site of the Humboldt Kinetic Association, currently embroiled in litigation because they did not pay their contractural obligation to the Glorious Founder, Hobart Brown. They claim to hold the titles to kinetic trademarks including the kinetic chicken and the motto "for the glory." At the present time, the entire board is also in extreme violation of rule #10, "have fun!" Baltimore, Maryland - Kinetic Sculpture Race has a wonderful website is created and maintained by the race sponsor, the American Visionary Art Museum. It has "Stuff everyone asks," photo galleries, entry forms, everything to prepare for the next one. The AVAM Kinetic Sculpture Race has run since 1999, making 2004 the 6th Annual. "Kinetic Baltimore" is a fabulous fansite for the AVAM race with photos from 2001 to 2004, rules, courses and awards through 2003. North Coast Journal Cover Story, May 20, 2004. Visionary artists race for the glory of mediocrity Johns Hopkins Newsletter, April 29, 2004. 2000 Baltimore KSR May 4, 2000 top story in the Baltimore Guide Online archive. 2000 Baltimore KSR Baltimore City Paper Online May 3 to May 9, 2000. Students win Golden Dinosaur, Pilots Award and Glorious Founder Award after carrying their broken sculpture 13 miles to the finish line. 2000 Baltimore KSR -- Washington Post article. 2001 Corvallis KSR photos and story from "the Rex Files." 2000 Corvallis KSR photos and story of "the Rex Files." Greater Port Townsend, Washington - Kinetic Sculpture Race early October, since 1983. 1996 Port Townsend KSR photos of racers. 1999 Port Townsend KSR photos of racers and awards. Klamath Falls, Oregon - Kinetic Sculpture Race is the newest kinetic sculpture race. June 18, 2005 - Details on the Kinetic Forum. Ventura, California - Kinetic Sculpture Race mid to late October benefits The Turning Point Foundation. 2000 Ventura KSR online diary. Boulder, Colorado - KBCO Kinetics sponsored by radio station KBCO Boulder (KADE a.m./KBCO f.m. ), KSR and 5K run in early May. KBCO 21st Annual Kinetic Sculpture Challenge. 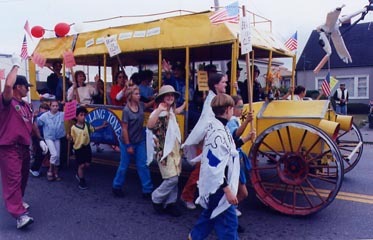 Allentown, Pennsylvania first KSR in 2002. It Will Have Blinking Eyes, homepage for China Blue which produced this 1993 documentary film about Kinetic Sculpture Racing and the people who live it. Over the past thirty-five years, the Grand Championship has been covered by Canadian, Japanese, and U.S. television shows including Good Morning America, Associated Press, United Press International, National Public Radio, The Osgood Files, Eureka Times-Standard, North Coast Journal and many others. Some video and press material is available at the Kinetic Sculpture Museum in Ferndale, California while more is archived by Hobart Brown. Hobart Tells All, by John Wilson and Hobart Brown (ISBN: 1879312077) is available through the Clarke Museum in Eureka (707-443-1947) and other sources. Crazy Contraptions: A light-hearted look at Ferndale's Kinetic Sculpture Race. Stan Bennett. 1975. Low Tide Lumber Company Publishers. 96 pages, paperbound. Cover photo by Duane Martin. Supported by Viola Russ McBride. No ISBN. 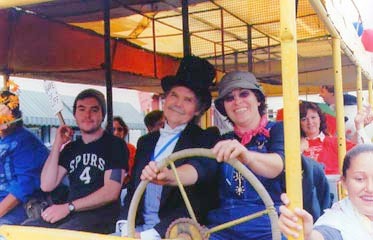 Rob, Hobart, Ellin, Theresa and other grownups on the People-Powered Bus being pushed by actors from "How to Eat Like a Child" and the Young Actor's Workshop in the parade in honor of Ferndale's 150th Birthday, August 24, 2002. The theme of the bus was Hobart's motto "Adults having fun so children want to get older." Photos by Ken Mierzwa.